VA loans are typically intended to help veterans resume civilian life after leaving military service, or as a perk of service even when used years down the line. These loans can pay for tuition, or buy a home. Terms are generous: VA loans generally have low interest rates – and require zero down payments. The official position from the Veterans Administration is that VA home loans are intended for residential property only, not for property that the borrower doesn’t use as a primary residence – whether or not such a property generates an income. 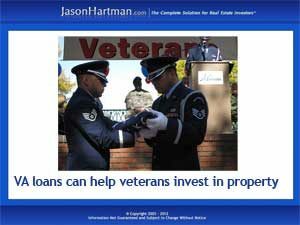 But for veterans hoping to get started building wealth in income property as Jason Hartman advises, there’s a way around that restriction. According to a recent post on Veterans United Network, a support site for veterans of all branches of the service, a VA home loan can be used to buy a certain kind of property – the small multiplex. The latest VA home loan rules do state that the loans are to be used for residential property, not investments – but they define “residential property” as one that can consist of up to four family units – and one business. That definition of residential property means that qualified veterans can get a VA loan –with nothing down — to buy a multiples of up to four unites as long as one of the units becomes a primary residence. The property could even include a business, as long as the borrower commits to living on one of the units while renting the others out. As an added boost, Veterans United Network reports that a veteran who intends to buy a multiplex with two to four unites can use up to 75 percent of the rental income from all units besides the primary residence to prequalify for the loan Plus, owning the property qualifies the borrower for the usual tax deductions available to investors, including mortgage interest.